I learned how to make a Guinness cake recipe which is made with Ireland's famous Guinness Beer. As you will find, it is used in many Irish recipes. Ireland is well known for its many alcoholic products; great whiskey, Guinness Beer and Irish cream being a few. This Guinness Beer brewery started in Dublin in the 1700s and has only grown in popularity around the world since then. It became the largest brewery in Ireland and by the 1900s it was the largest brewery in the world. The Irish people are very proud of the beer and their Irish whiskey. I learned how to make a chocolate Guinness cake recipe which is only one of the cakes which beer is added. It is no surprise that chocolate would be one recipe since chocolate is the favorite flavor everywhere in the world and for the Irish adding Guinness Beer to chocolate has to be a hit. This kind of cake has to be a fairly recent addition to their cuisine. As I understand, for the most part, ovens were not available in kitchens in Ireland until the nineteenth century so cake baking, cookie baking, any many current Irish appetizers were not an option. If it couldn’t be made over the hearth or on stove top, it couldn’t be cooked. This is why the stews, like the Irish lamb stew, were all cooked on the top of the stove or hearth. 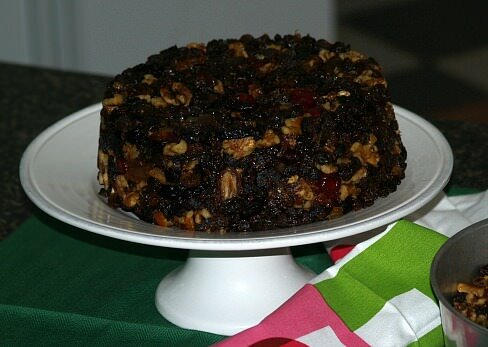 There were unbaked desserts in the Irish menu; one being an unbaked fruitcake recipe. 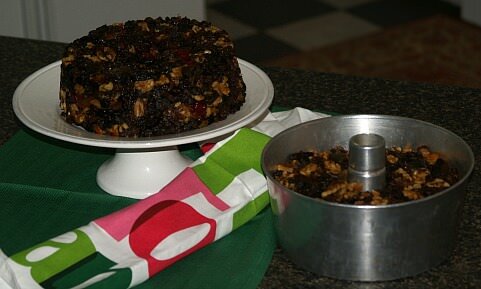 I learned how to make this Guinness cake recipe which is easy to mix together and it will last indefinitely. After cutting the fruits and nuts mix thoroughly and press tightly in a pan or mold. Let it set at least one week before cutting to let the flavors blend. After cutting fruits and nuts, mix thoroughly. Pack tightly in any container you choose. (I use 2 angel food cake pans.) Let stand for one week before cutting but this cake will last indefinitely. NOTE: This is a very large recipe; it makes two large fruit cakes. I make mine at least one month before I want it. I try to press it down at least every other day for the first week. Grease and lightly flour 9X13 inch baking pan. Sift together the flour, sugar, cocoa, soda and salt. Add to the dry ingredients the oil, vanilla, vinegar and beer. Blend well and pour into prepared pan. Beat butter until fluffy gradually adding sugar; add eggs one at a time beating after each. Combine flour, baking soda and salt; add to creamed mixture alternately with beer. Mix until well blended; stir in nuts and raisins. Pour mixture into a greased and floured 9 X 13 inch baking pan; bake 25 to 30 minutes or until pick comes out clean. Mix together ½ cup finely chopped walnuts, 1/3 cup sugar and 1 teaspoon ground cinnamon; sprinkle over top and let cool. Beat sugar and oil until smooth; Add egg yolks, beating well. Combine beer, flour, cinnamon, nutmeg and salt; add to sugar mixture and beat well. Stir in sweet potatoes, pecans and vanilla; set aside. Beat egg whites on high speed until stiff peaks form; gently fold into batter. Spoon batter into 3 greased and floured 9 inch round cake pans. Bake at 350F degrees for 25 to 30 minutes or until pick comes out clean. Cool in pans 10 minutes, remove from pans and cool completely. Combine milk, sugar, egg yolks and butter; bring to a boil over medium heat stirring constantly. Cook mixture twelve minutes while stirring; remove from heat.